KdineyBuzz.com has been working overtime to help as many patients as possible join the list for Artificial Implantable Kidney Human Trials consideration. The following need-to-know facts about the Artificial Implantable Kidney, presented to us by the Research Team at the University of California San Francisco, are critical for any patient that is excited of the prospect of upcoming Human Trials and ultimate success of the device. If you are not already signed up for human trial consideration, then promptly complete the below form to be contacted. KdineyBuzz.com has been working overtime to help as many patients as possible join the list for Artificial Implantable Kidney Human Trials consideration. The following need-to-know facts about the Artificial Implantable Kidney, presented to us by the Research Team at the University of California San Francisco, are critical for any patient that is excited about the prospect of upcoming Human Trials and the ultimate success of the device. If you are not already signed up for human trial consideration, then promptly complete the below form to be contacted. QUESTION #1: Are you eligible for the Artificial Implantable Kidney if you are not yet on Dialysis or is it exclusive to those whose kidneys have totally failed? ANSWER #1: According to the Artificial Implantable Kidney Research Team, "this is case-specific, so it would depend on the details of a particular patient’s case and will be decided by both the patient and physician." QUESTION #2: Who decides who will participate in the clinical trials? Is there anything that I can do to improve my odds of selection? ANSWER #2: To ensure that the clinical trials are conducted safely and without bias, the Research Team has decided that all patient selection decisions are led by the Medical Team. None of the Artificial Implantable Kidney management or staff are able to contribute or personally recommend any particular individual for participation in the trials. What's more, financial contributions to the project do not mean that a patient that contributed will be involved in Human Trials. This is to protect the integrity of the project and ensure that all participant decisions are made for medically and scientifically sound reasons. QUESTION #3: How long will clinical trials take to complete? ANSWER#3: There are several required steps to the clinical trial process. While the initial Human Trial is anticipated to begin by early 2018, once the initial clinical trial is completed and the data analyzed the Researchers will still have to apply to conduct a follow-up study to test components of the Artificial Implantable Kidney, namely its ability to filter human blood. In total the Artificial Implantable Kidney device is expected to take years to complete with a final stage of clinical trials by 2020. Of course, this scenario assumes that the Research Team has sufficient funding and no unanticipated scientific, technical, or regulatory drawbacks. Hence, stay tuned for any upcoming petitions or announcements regarding this device from KidneyBuzz.com. QUESTION #4: What is the surgical process like to insert the device? Where can I have the procedure done? ANSWER #4: The procedure will be similar to kidney transplant surgery and it will be performed under general anesthesia. Once the Artificial Implantable Kidney is available publicly, the procedure can be completed at any hospital with a trained transplant surgical team. QUESTION #5: Will this device be covered by insurance? ANSWER #5: Generally, medical devices that are successful are products for which insurance provides coverage. 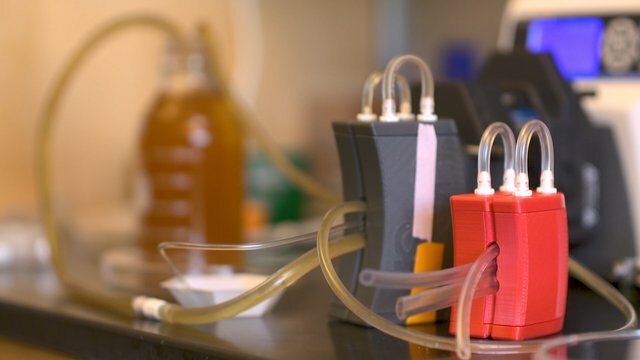 The analysis as described to KidneyBuzz.com suggests that the Artificial Implantable Kidney will be associated with over 50% cost savings compared to Dialysis and, as such, it is anticipated that the device will be attractive to institutions considering coverage decisions. Are you ready for the upcoming Artificial Implantable Kidney Human Trials? Are you signed up for consideration? If not, why not? Share your insights with the over 66,000 KidneyBuzz.com Facebook friends (click here). Also, share this article far-and-wide so that others in the community can gain inspiration knowing that the Artificial Implantable Kidney is drawing nearer. Moreover, consider following the nearly 250,000 monthly visitors on KidneyBuzz.com for your Number One (1) source of Daily News, Information, Impact Meals, Inspirational Quotes, and tailored Products and Services which teach Chronic Kidney Disease, Dialysis, Kidney Transplant, Diabetes and High Blood Pressure patients how to better manage and improve their lives.